It's long been the case that desktop PCs have offered more graphical grunt than laptops. Now, Nvidia claims to have levelled the playing field by squeezing a desktop-class GTX 980 into a new fleet of monster gaming machines. The Origin EON-15X was the first gaming laptop to pack a desktop-grade processor inside. Now the GPU giant has slipped a GTX 980 (note the lack of an "M") into six new laptops sporting adaptive G-Sync and other frame-smoothing capabilities. Expected to land before the end of December, they can be configured with between 4GB and 8GB of speedy DDR4 memory clocked at 7Gbps. The move could finally lead to laptops that are capable of cranking out respectable frame rates when powering games at 4K resolution. Nvidia, which has drawn praise from VR pioneer Oculus Rift and Epic Games for the move, reckons they'll let you do VR on the go for the first time too. The company boasts that 980-equipped laptops can run games at 1,680 x 1,512 x 1,512 - the render resolution of HTC's Vive headset. 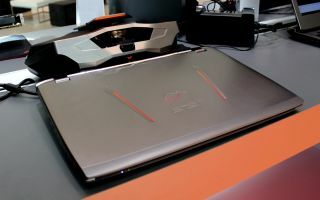 Described as the "world's first notebooks built for enthusiasts," the new 980-equipped machines are: the Aorus X7 DT (which features G-Sync), the Asus ROG GX700 (G-Sync, and water-cooling), the MSI GT72 Dominator (G-Sync), a refresh of the 18.4-inch MSI GT80 Titan, the Clevo P870DM (G-Sync) and the Glevo P775DM (G-Sync). Nvidia points to advancements in its Maxwell GPU architecture as the turning point that allowed it to squeeze the GTX 980 into a laptop chassis while balancing battery life and power - a tricky feat considering that models vary in shape and size and have different thermal design requirements. Still, it could be worth it. Nvidia's benchmarks point to silky smooth gameplay at 1080p and beyond, with the new GTX 980-equipped MSI GT72 Dominator achieving 61FPS in The Witcher 3, 89FPS in Grand Theft Auto V and 84FPS at Full HD resolution with graphics dialled up to Ultra. And they could go even further. The 980 has been designed "from the ground up for overclocking" to provide enthusiast levels of tweakability, Nvidia says. The company has given manufacturers access to its APIs to develop their own overclocking tools used for altering memory, GPU and CPU clock speeds - just as you can on a desktop. The ability to control fan speeds, a tool usually reserved for desktop gamers, will let you manually speed up or slow down internal fans. This can be handy for making the machine quieter when not gaming, or raising the speed when tinkering with manual overclock settings. An Nvidia spokesperson told us that 980-equipped notebooks are "on a par" with models toting its 980M GPU in terms of sounds levels when under heavy load. Of course, we're champing at the bit to verify all of the company's claims ourselves. There's no prices yet for the machines, but you can expect them to cost a fair bit more than ones currently rocking Nvidia's 980M chip, which aren't exactly wallet-friendly. How far will the GTX 980 push gaming laptops?